Designed for the '95-'99 M3 and can be used on any '92-'99 E36 3-series (except 318ti, can use front bar only). When setting out to design our SwayBarbarian, we looked at some important criteria which others had not addressed. There is the issue of stiffness characteristics which were achieved, but to set the system apart from others, we have incorporated some unique features found only on the SwayBarbarian. Professional race quality. Used by world-class racing team ERT in the Speedvision Motorola Cup series and is the official BMW CCA design for SE36. Quality. 100% made in USA with computer-controlled fixtures and precision water jet cut ends. Superior Adjustability. 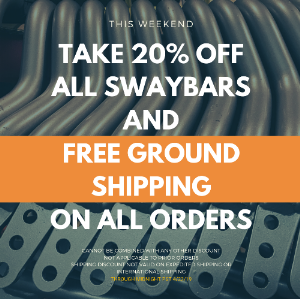 The SwayBarbarian uses a multi-hole system on the front and rear bars which allows for fine tuning of the bar for whatever desired effect, without sacrificing body roll. Optional complete kit, or choose only front or rear bar. Revised contouring for maximum clearance even with extremely lowered cars. Positive-stop rear bushing guides assure bar stays in place. Optional center-adjustable rear endlinks with premium-quality spherical bearings for silent operation - no clunks or rattles. Recommended for lowered cars or those with adjustable suspension. Unique optional center-adjust rear endlinks suitable for street or track use allow changes without disassembly of link or bar. Fitted with premium-quality spherical bearings for silent operation - no clunks or rattles. Recommended for lowered cars or those with adjustable suspension. 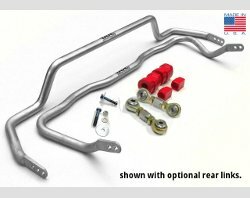 Add $129 for rear links. An anti-sway bar is designed to reduce body roll. It keeps your vehicle flatter in the turns by transferring the pressure exerted on the outboard wheels and applying opposite pressure on the inboard wheels. In this way weight is more evenly applied to all four wheels, helping the vehicle stay more level with the road. When the 95 M3 was introduced, it was said to be a agile handling car, with some body roll, with a tendency to understeer. When the 96 M3 was introduced, the car is said to have increased tendencies to understeer more with no improvement in reducing body roll. By specifying more narrow front tires with wider rear tires, the car will want to continue to stay "planted". Since US M3s do not have enough horsepower to effectively throttle steer, the this new balance causes the newer M3s to understeer more (or plow) when pressed to the limits. When comparing the stock sway bar sizes to aftermarket bars, to the 95 M3, you find some interesting results. Dinan's sway bars are designed to dial in more oversteer, to counteract the factory designed understeer. However, this is at the expense of increase front body roll. Yet, when applied to the newer M3s, the picture changes. The 96-99 M3's tendency to understeer more than the 95 M3 is increased with the imbalanced nature of the rates of stiffness. Dinan's increases are now less dramatic, but still does not do address the issue of front body roll. What do the numbers mean to me? With all of the "mathematical" increases in stiffness, what does it mean to you, the driver? Extensive testing has shown that as driver skill increases (at the track/auto-x) that sway bars that increase stiffness too much cause inside front wheel lift in corners. By making a front end too stiff (to decrease body roll), the chassis is not able to plant both wheels under turns with increased speed. Anything stiffer than a 27mm front bar has shown to be stiff enough (and can be reduced in stiffness) to be the ideal size. What about the rear bar? A common misconception is that the increase in rear bar stiffness alone is the sole cause for bent (or broken) rear sway bar tabs (the tabs which mount the sway bar bushings). In fact, even under race conditions, most racecars do not break the tabs. Rather, rear sway bar tabs bend (or break) because of daily obstacles such as potholes, construction, and other road hazards. It is the sharp transition and weight shift in such conditions which will weaken and stress the factory tabs. In the events that the tabs do break, they are built into the rear subframe of the vehicle, which becomes a costly replacement. As an example of our attention to detail, the E36 M3 Sway Barbarians is a very unique set of bars. The rear is an asymmetric shape, allowing for a fit unlike any other aftermarket sway bar. Most aftermarket swaybars will usually wind up hitting the exhaust system under full droop situations (when the rear suspension is complete extended such as on a lift). The Sway Barbarian has a unique bend to less this possibility. Was this advanced engineering? Was it rocket science? Was it difficult to design? The answer to all of these questions is no. It's common sense. - Precision laser-cut adjustable ends. - Optional greaseable and adjustable rear end links for silent operation - no clunks or rattles. We put our bars through this extensive process to insure that the final product will be the strongest, most durable bar available, and that it will be the most resistant to form alteration. The SwayBarbarian uses a multi-hole system on the front and rear bars which allows for fine tuning of the bar for whatever desired effect without sacrificing body roll. After the bars are CNC mandrel bent and the ends are laser cut, a silver powdercoat is applied for a smooth, long lasting finish in a similar process to how factory bars are coated. This smooth finish allows the bars, when properly installed with polyurethane bushings and grease, for long term performance with minimal maintenance. New Gen2 endlinks have steel-lined urethane bushings with standard grease fitting for long noise-free life. No squeaking, clunking, or clicking as with "race" links. The SwayBarbarians include replacement polyurethane bushings which have a unique "rifle-drilled" center. This allows for grease, when used during the installation, to remain in the groves of the bushing for long lasting, quiet results. Be sure to use generous amounts of grease to ensure maximum performance from your SwayBarbarians! Copyright (c) 1999-2016 UUC Motorwerks; All rights reserved. From Anonymous of Mount Sidney , Virginia on 10/23/2018 . From Stephen Manjai of Dubai, United Arab Emirates on 3/27/2018 . From R. Davidson of Goose Creek, South Carolina on 8/12/2015 . Would recommend these to anyone!! From Anonymous of Pinole, California on 8/3/2015 . E36 REAR SWAYBAR REINFORCEMENT KIT – A must-have for enthusiast-driven cars!